Suffering in the context of ministry is expected—and it’s never wasted by our faithful Savior. How do you discern a call to ministry? You’re confident in your communication skills. You have a track record of leading and influencing others. You enjoy talking about God and all the most important, life-changing, eternal ideas. By this standard, being a pastor seems like a pretty decent gig. Who doesn’t enjoy helping others? Or at least being seen by others as wise, godly, and indispensable. Unfortunately, discerning your call this way can become self-centered. And it becomes less about laying down our lives for Christ and others than about self-actualizing, and discovering who we were meant to be. When we’re called to ministry, we serve as under-shepherds for the Good Shepherd. We have the mind of Christ. We are servants, emptied for the sake of others, so that they will see the exalted Christ and glorify the Father who sent him. You might describe the pastor’s job description this way: Follow Jesus and prepare his people for eternity. Prepare them to suffer as he did and for his sake, so that they might enjoy great reward in heaven. In ministry we’re often at head of the line for suffering and joy, as we share in the ups and downs of our congregation. We must be especially prepared, then, to suffer well, so that we might run the race marked out for us in joy (Heb. 12:1). 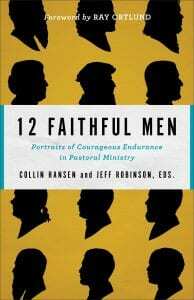 Toward that end, here are seven steps to endure for a lifetime in ministry, finding inspiration in Scripture and in examples from church history featured in the new book 12 Faithful Men: Portraits of Courageous Endurance in Pastoral Ministry. 1. Pad your résumé with weaknesses. The typical pastoral search committee seems to want you to evangelize like Billy Graham, think like Tim Keller, and counsel like David Powlison. They may give you extra attention if you can sing like Kirk Franklin. Why should we boast in our weakness? [Because] human strength is a mirage. Are they servants of Christ? I am a better one—I am talking like a madman—with far greater labors, far more imprisonments, with countless beatings, and often near death. Five times I received at the hands of the Jews the forty lashes less one. Three times I was beaten with rods. Once I was stoned. Three times I was shipwrecked; a night and a day I was adrift at sea; on frequent journeys, in danger from rivers, danger from robbers, danger from my own people, danger from Gentiles, danger in the city, danger in the wilderness, danger at sea, danger from false brothers; in toil and hardship, through many a sleepless night, in hunger and thirst, often without food, in cold and exposure. And, apart from other things, there is the daily pressure on me of my anxiety for all the churches. Who is weak, and I am not weak? Who is made to fall, and I am not indignant? If I must boast, I will boast of the things that show my weakness. Why would we pad our résumé by boasting in our weakness? Because then the power of God will be more evident in us. We will show that it’s not the pastor alone who works, but the same Spirit who indwells all believers with resurrection power. 2. Admit your plans may not be God’s plans. Geneva, Switzerland, is one of the most beautiful cities in world. I’ve visited three times, and I can’t wait to go back. But John Calvin had to be persuaded twice in the 16th century to stay. He wanted a quiet academic life. Instead, God intended him to serve as a pastor. [The Psalms] will principally teach and train us to bear the cross. . . . By doing this, we renounce the guidance of our own affections and submit ourselves entirely to God, leaving him to govern us, and to dispose our life according to his will, so that the afflictions which are the bitterest and most severe to our nature, become sweet to us, because they proceed from him. Calvin lived the remainder of his days as an exile and ministered to fellow French exiles. He reminds us that like the “elect exiles” of 1 Peter, we’re all eagerly awaiting our eternal home. 3. Look for Christ in even the dark and dismal corners. Many of Christianity’s greatest heroes suffered in prison. Corrie ten Boom harbored enemies of the Nazis and ended up in a concentration camp with her sister, Betsie. Paul wrote his letter to the Philippians from prison. And John Bunyan wrote 60 books, many from prison, including Pilgrim’s Progress, one of the bestselling books of all time. I never knew what it was for God to stand by me at all turns, and at every offer of Satan to afflict me as I have found him since I came [to jail]; for look how fears have presented themselves, so have supports and encouragements, yea, when I have started, even as it were at nothing else but my shadow, yet God, as being very tender of me, hath not suffered me to be molested, but would with one scripture and another strengthen me against all; I could pray for greater trouble, for the greater comfort’s sake. You won’t always know where and how God will reveal himself. But you can be sure that nowhere is beyond his sight and reach. 4. Don’t give in to self-pity when you’re rejected. Almost every book I’ve written or edited features Jonathan Edwards. Can anyone be a better role model for success in ministry? His church experienced revival. He helped shape the transatlantic evangelical movement. Public-school students still read his sermons. Yale University publishes everything he ever wrote. Seminaries name study centers for him. He extended a ministry dynasty when he took over the same church his grandfather previously led for 60 years. And Edwards got fired, by the same church that had once enjoyed revival under his leadership. He had gone against his grandfather’s more permissive policy toward the Lord’s Supper. Edwards demanded evidence and public profession of faith from youth seeking church membership. But many residents of Northampton, Massachusetts, felt like he was changing the terms of agreement and judging them as spiritually lax. In trying to lead a congregation, pastors are always in danger of biting the hands that feed them (and their families). Pastors are always in danger of biting the hands that feed them (and their families). Even in his remarkable farewell sermon, Edwards never budged from his conviction or from his spiritual responsibility for the church and community. As evidence of this love, he continued to serve for several months during the search for replacement. That must’ve been awkward. After Northampton, Edwards would move to Stockbridge and serve as a missionary to Native Americans from 1751 to 1758. There he published his best-read work, The Life of David Brainerd, and many other all-time classics: Freedom of the Will, Concerning the End for Which God Created the World, The Nature of True Virtue, and Original Sin. In ministry you will face setbacks. You may even be fired, and you may wonder how to care for your family. But self-pity will only inhibit a faithful response and subsequent service to which God is calling you. 5. Opposition doesn’t necessarily mean you’ve been unfaithful or that God disapproves. We want people to like us. But if you care too much about people’s opinion, you might not be cut out for ministry. If you care too little, though, you might not be cut out for ministry, either. The point is that we can’t gauge the effectiveness of our work solely by how people respond. If Jesus told us to expect persecution for following him, then actually opposition might be a sign of faithfulness. Such was the case for Charles Simeon. He grew up among the British elite of the mid-18th century and enjoyed the evangelical awakening as a young man. He took over the famed Holy Trinity in Cambridge at age 23 in 1782. Cambridge was not exactly a bastion of piety. Back then evangelicals were known derisively as enthusiasts, because religion was meant to be endured, not enjoyed. Opposition was intense from the start. Church leaders locked their pews up front (yes, back then you paid for your preferred seating) and didn’t show up. They took chairs he set up and tossed them out windows. They locked up the church when he tried to start a Sunday evening service. Cambridge scheduled classes the same time as his preaching so students couldn’t attend. He was pelted by rotten eggs. Once he escaped beating or worse when he changed his exit door to avoid thugs prowling his usual route. He did not give up. He did not give in. And we’re so glad he didn’t. From his ministry emerged Universities and Colleges Christian Fellowship, InterVarsity Christian Fellowship, International Fellowship of Evangelical Students, and more. If you care too much about people’s opinion, you might not be cut out for ministry. If you care too little, though, you might not be cut out for ministry, either. We are afflicted in every way, but not crushed; perplexed, but not driven to despair; persecuted, but not forsaken; struck down, but not destroyed; always carrying in the body the death of Jesus, so that the life of Jesus may also be manifested in our bodies. For we who live are always being given over to death for Jesus’s sake, so that the life of Jesus also may be manifested in our mortal flesh. 6. Wait for God, especially if you don’t know where he is. We published this book in part because of what we saw and read about pastoral suicides, which increased 24 percent between 1999 and 2014. It’s hard to know exactly why. The job involves high pressure, but that’s not new, as we’ve seen in these pastoral profiles. If anything the stigma against clinical depression has somewhat lessened, and medicine is more widely available. Whatever the reasons, pastors are often weighed down by sorrow. We’re worried about adding our burdens to others and letting them down if they knew our struggles. And then shame overwhelms us. There may be no more successful pastor in history than Charles Spurgeon. Probably no one outside the biblical writers is quoted more often today, especially by pastors, than the “Prince of Preachers.” And yet he suffered from what he variously called his personal struggles “fainting fits” or “spiritual sorrows.” Remarkably for his time in the mid-19th century, he openly admitted these feelings of despair and discouragement. He never fully recovered from an incident on October 19, 1856, when one of his critics shouted, “Fire!” in his crowded church as Spurgeon preached. This act resulted in a stampede of thousands with seven dead and 28 seriously injured. Spurgeon was only 22 years old. He had only been married 10 months earlier. He was in the first month of parenting twin boys. Still more critics blamed Spurgeon for the tragedy. His wife, Susannah, thought he might be going insane. Still, he preached, and with honesty about his condition. I almost regret this morning that I have ventured to occupy this pulpit, because I feel utterly unable to preach to you for your profit. I had thought that the quiet and repose of the last fortnight had removed the effects of that terrible catastrophe; but on coming back to the same spot again, and more especially, standing here to address you, I feel somewhat of those same painful emotions which well-nigh prostrated me before. You will therefore excuse me this morning . . . . I have been utterly unable to study . . . . Oh, Spirit of God, magnify thy strength in thy servant’s weakness, and enable him to honor his Lord, even when his soul is cast down within him. He was still suffering post-traumatic stress 25 years later during a large Baptist Union gathering when he endured a panic attack. When the darkness descends, sometimes change in circumstances can help. Improved diet and more exercise can help pastors who spend much of their days sitting and eating. Sometimes pastors need to resign and move on. Sometimes medicine can be their bridge toward a healthy norm. In these times we must be careful not to make any hasty decisions we can’t take back. This is why pastors shouldn’t think about their future on Mondays. God is there, whether or not we can see him or feel him in the Monday blues. He speaks through his Word. He hears us, even if we’re only groaning. Jesus is the head of the body of Christ, his church. And on that coming Sunday we will again partake in his body broken for us and his blood shed for us in the Lord’s Supper. Pastors shouldn’t think about their future on Mondays. We’re sure to be discouraged. Some of us are prone to melancholy, as Edwards was. Some will suffer clinical depression. Again, eternal perspective is key. We live in a fallen world where sin and its effects afflict body and mind. Waiting on God may be indefinite. And the only scenario that makes suffering ultimately bearable—what made Paul call it light and momentary—is the final redemption of all things by Jesus Christ. If he’s not resurrected, then we have no hope. But since he is, then we have all the hope we could ever need. 7. Do the right thing, even if you think it’s too late. Who are the real heroes, from the vantage point of heaven? I wonder how things will look when the first are last and the last are finally first. Wang Ming-Dao isn’t well known in the West, but he’s been called the dean of the house churches in China. His ministry started in 1923. Like many other pioneering leaders, he was known for uncompromising convictions and behavior. He expected criticism and persecution. Which is good, not only because it’s biblical, but also because he ministered in 20th-century China, where Christianity would conflict with communism. Wang wasn’t interested in comfort or fame, so he was just the kind of leader to help direct dynamic Chinese churches. A common theme in Chinese history is government control over churches. This issue recently recurred with Pope Francis’s deal to recognize Catholic bishops selected by government. It was also an issue under Japanese occupation during World War II. Wang resisted Japanese influence that wanted him to promote their mission. And then, under communism, he resisted again. Wang rejected the government-run Three-Self Patriotic Church on several grounds, mainly theological. He wouldn’t partner with pastors who rejected belief in creation, virgin birth, vicarious atonement, bodily resurrection, and the physical return of Jesus. He was harassed by the communist government from 1951 to 1955 and arrested on August 7, 1955, after a stinging critique of Three-Self liberals. The government released him after a year—but only after confessing to crimes he didn’t commit. He didn’t think his wife, or other church leaders arrested with him, would hold up in prison. So he fessed up to get them out. But he never did join the state church. He couldn’t live with his decision to recant. So he and his wife went back to jail in 1957. He didn’t get out until 1979. She was released in 1974. This initial decision to confess haunted Wang. He sought and received forgiveness for recanting his views on the state church and government. He did the right thing, not knowing the consequences. The government sought to rob him and his family of their life and ministry. But they failed. The houses churches thrived, though still under pressure to this day. Billy Graham and other international Christian ambassadors supported Wang. And we remember him now, not only as man of uncommon conviction, but also as recipient of grace in his weakness and failure to live up to his ideals. We remember all of these men as heroes. The kinds we’d like to imitate. But we must understand what made them great. Yes, they demonstrated God-given genius, hard work, and determination. But common to every great leader is willingness to faithfully endure hardship. This is a God-appointed means for our sanctification and other purposes beyond the horizon of our understanding. Common to every great leader is willingness to faithfully endure hardship. We’re not above suffering, because we’re not above Jesus. And he learned obedience through what he suffered (Heb. 5:8). He suffered for the joy set before him (Heb. 12:1–2)—namely, his eternal exaltation, in which we also rejoice. The key to enduring for a lifetime in ministry is to remember that we live for Jesus, for eternity.